Even if you regularly follow the world of wristwatches, you may not be familiar with Balmer watches. If that’s the case, you’ll be surprised to discover that the company has been in business, off and on, since the late 18th century. They started as a Swiss company that made movements and watches for other companies to sell under their own name. In recent years, the company has been “brought back to life” like a number of other older brands, and the company now produces high quality Swiss-made wristwatches that are sold under their own name. The company seems to specialize in men’s movements, and their timepieces feature bold, oversized cases with designs that aren’t overly subtle. They’re well-built watches that look good and will last for years. Read on for the full Balmer watches review. You’ll find both mechanical and quartz electrical movements, encased in either 316L stainless steel or bronze cases. Their models feature screw-down crowns and rock hard, anti-glare sapphire crystal to protect the watch face. Water resistance is quite good; most models feature either 100 or 200 meters of water resistance. All of the models we’ve seen came with a leather strap. The movements are Swiss in origin; the mechanical movements are sourced from Leschot S.A., while the quartz electronic movements are sourced from another Swiss company, Ronda. These watches offer some interesting features not often found on watches in their price range. Models include a few that are time-only, but we also saw models with a moonphase complication, a date complication that used a hand to indicate the date, rather than a numeral, and a “week of the year” complication that we don’t recall seeing before. Most, if not all models feature Superluminova luminous hands, making it easy to see the time in the dark. In addition, all models feature an engraved case back. The Legacy Collection includes limited edition models, including one that was limited to just 99 units that featured a case carved from a solid piece of bronze. Balmer watches feature a number of available complications, as well as a chronograph in the GT Collection. 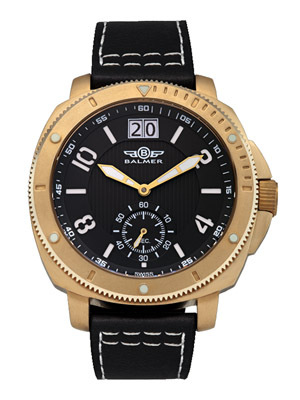 While most models feature the common white, black, gold or silver colors, one model in particular, the Cobra Vaughn, features a number of bright color options for the case. These watches are great for both daily wear and special occasions. Care and maintenance is straightforward. The models with Ronda quartz electronic movements will only require occasional replacement of the battery. If you have a model with a mechanical movement, you’ll likely want to have the watch examined every five years or so to ensure that the movement is running smoothly and that there are no worn parts that need to be replaced. As with all watches, you should keep your watch away from extremes of temperature and strong magnetic fields. With proper care, your watches should run well for years to come. Unlike many watch brands, Balmer does not seem to offer models made especially for women. While there’s no rule that says that women cannot wear a man’s watch, the large case sizes may make them too large for most women to wear. If there’s a place where this brand’s watches are a bit subpar, it’s the warranty. Balmer watches are warranted by the manufacturer against defects in craftsmanship and materials for one year from the date of purchase. This compares with the two year warranty offered by probably 90% of all watchmakers. These watches are well tested at the factory prior to shipping, so defects are likely quite rare. Given the high quality of materials, such as stainless steel and bronze cases, good water resistance and sapphire crystal face protection, these watches are affordably priced, as Swiss watches go. 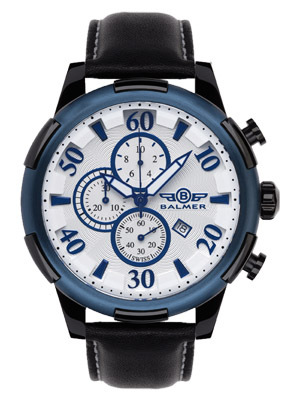 Prices vary from one retailer to another, especially online, but the price range for Balmer watches seems to run from a low of about $500 to a high of $1500 or so for the 99 piece only limited edition DB5 model. When you consider that other Swiss watches with similar components and build quality often sell for $5000-$10,000, these watches are a relative bargain in comparison. While the company Website did show examples of their product line, they did not, oddly enough, offer any of their watches for sale, nor did the site include any information about where you might purchase them. 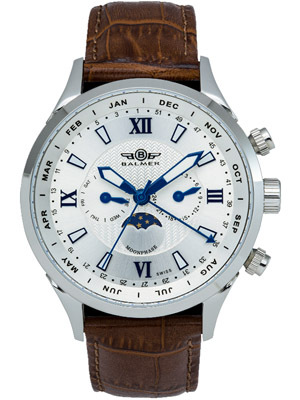 Fortunately, there are a number of places where you can buy Balmer watches. Unlike many watch brands that are currently available only online, you can buy them in a few brick and mortar locations. Sears carries them, as do a few other watch specialty stores. Of course, you’ll likely find a better selection by checking online retailers, and shopping online will also give you the best opportunity to buy at a discount if you’re cost-conscious. Keep in mind that no single retailer is likely to carry the entire product line, as models come and go and availability varies from model to model. Still, most online retailers should have a good representative sample. Lots of people would like to buy a Swiss watch, but most watch brands from Switzerland tend to be a bit on the pricey side for the average buyer. In contrast, Balmer watches are fairly affordable, despite the fact that they use Swiss movements, steel cases, and sapphire crystal in their construction. Water resistance is good, their models offer a nice selection of features, and even their limited edition models are priced at under $2000. If you’re looking for a quality Swiss-made watch without spending a fortune, you might want to look at Balmer watches.